The idea for “Going Up To Canada” is a take on a phrase I heard a long time ago while growing up in Labrador and it has stuck with me for so long until I had a chance, an opportunity to find the right venue and project to develop it. Thanks OO7 Collective! Before 1949 Newfoundland and Labrador was under British rule and was not part of Canada and so when people left home (even after joining Confederation) they would say their Going Up To Canada. So this is the idea behind my art piece for the exhibition “It’s Complicated”. It’s about community, family, connections and finding ones’ way in a complexed society and relationships (after the layers are peeled back, the path is never straight!) to a certain degree its’ photo-biographical in nature. Labrador (and Newfoundland) has only been a part of Canada for about 68 years and so in that sense, we have a long way to go to determine how, what and when to celebrate Canada150 (68 years- yaaaaaay; 60 percent of that history. Some of us have a ways to catch up and some of us don’t want to at all! This, This is my personal path. My journey started in Labrador with many paths along the way, through every province and territory (I am a lucky guy) to a pause here, currently in Ottawa. But yet it is the personal path of every Canadian from coast to coast to coast. Every Canadian does not have the same path as me, but every Canadian has taken a journey to get to where we are now. Which path will this one lead too, it is yet to be determined, as every ones journey, continues from here. For “Surveillapocalypse” Brooklyn-based art collective artCodex invites Canada-based Native American [sic] collective OO7 to collaborate on an exhibition on building trust between communities in the face of a security obsessed society and the ever-increasing surveillance that goes along with it. The artwork selected for Surviellapocalypse is part of the Eskimo Identification Tags series. The work for this exhibition examines the idea of tracking, counting and imposing a system of identification by the government that was totally foreign to Inuit. It was a system that still has, to this day, mixed feelings for Inuit. Even in examining the word “Eskimo” there are inaccuracies; Inuit in Canada have always identified themselves as Inuit, which means the “People” in Inuktitut, the Language of Inuit. The word Eskimo is viewed as a derogatory. The work reflectsan imposed system that was developed with little or no consultation with Inuit. Government officials and others went north and upon arriving could not understand the Language or the naming system. They took it upon themselves to develop a system that they believed would solve their problems without thinking of the real consequences on the Inuit people. 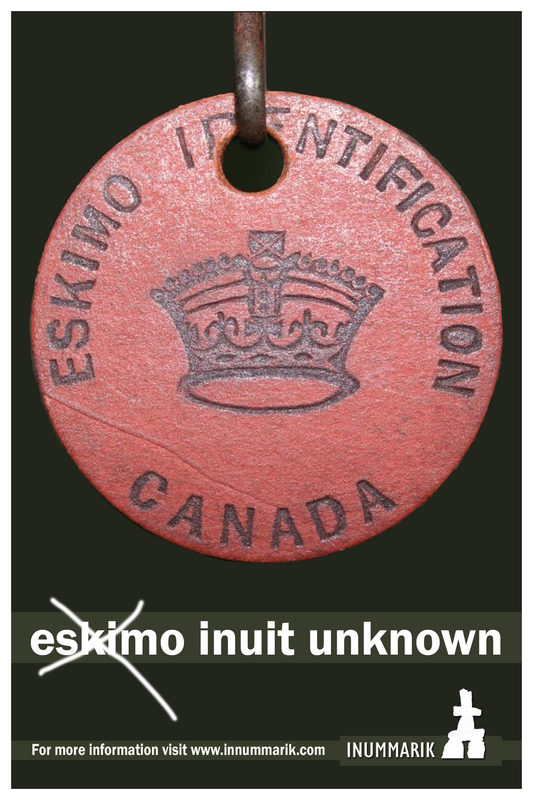 The “Eskimo Identification Number” program allowed the Government and others to record, name and provide numbers. 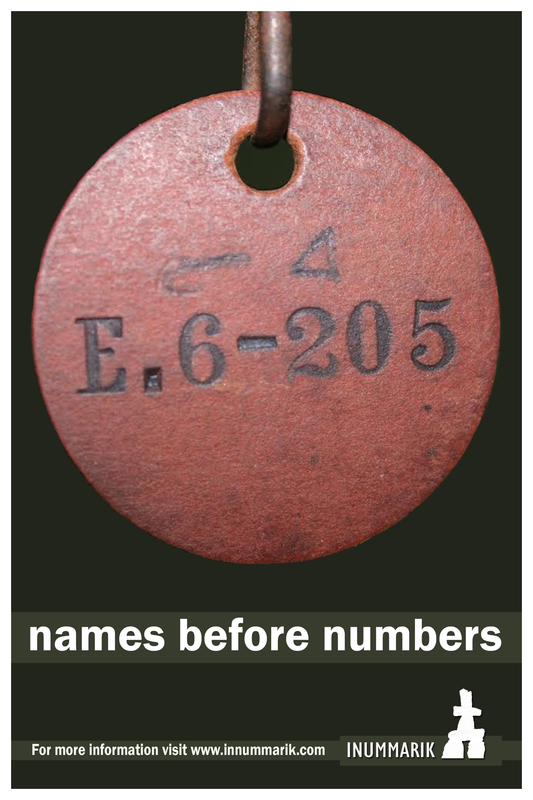 Inuit either wore the tags or had to memorize their Eskimo Identification Number. The system (Colonial) focused on bringing people that traveled the land to follow the migration of animals to a more counted therefore a more “censured” lifestyle. The results have had far reaching effects on Inuit culture. From an independent, self- sufficient society to being ‘baptized’ in Colonialism, Inuit life and culture has shifted. From living on the land to living in a settlement (some view as civilized), the effects are multiple. From knowing one’s place in society to living in between two world (loss of Language, culture, diet, hunting practices, food security/insecurity, roles and social problems), Inuit continue to struggle to define who they are and to bring harmony and balance to themselves, their community and culture. Before Colonial contact, naming an Inuit child was the responsibility of the Elders. Inuit of the Eastern and Western Arctic traditionally had one name and this created confusion for government officials, missionaries, and census developers, especially if Inuit were identified as having the same name (or variations) as another community member. In 1970 “Project Surname” commenced and Inuit began to adopt last names. Inuit culture is based on oral traditions. Inuit did not have a writing system until missionaries introduced the syllabics writing system. So in essence you have layers of many imposing systems – a system of writing, naming with Christianized names and then numbering for identification. In the 1970s when the Inuit started the intentional process of self-determination and self-governing it was then the Inuit started to deconstruct and debunk the systems that attempted to categorize the “eskimo” by the outsider. If you look at the term Inummarik, which means “Real Inuk” in Inuktitut, it’s not only a state of being it encompasses a complex and organized philosophy by which Inuit described themselves prior to Colonialism. Here I use Inummarik as a term that encapsulates how Inuit are attempting to regain their Inummarik (real ‘Inuk-ness’) from the effects of Colonialism through self-determination and the implementation of our system(s) to manage our own future as Inuit. E Number explanation: The E stands for Eastern, the number 6 depicts the community or region and the number (205) was the number allotted to the individual.